Without trying to scare modellers away from their hobby, this article tries to tell a little about some of the health risks that occur when building scale models. As most of you will probably know well, the hobby of building scale models from trucks, tanks, airplanes and ships has taken a enormous jump forward the last 10 years. New techniques as well as new materials have created a whole new era in making replicas of the subjects we admire for one reason or another. With all those new materials new chemicals were also introduced to the hobby. Think about glues, paints and plastics. Some of these materials can form a risk for your health. 1st: I work in a chemical plant and have recieved a lot of training about the dangers of certain chemicals like solvents, I feel that I should share this information with other modellers. 2nd: In our Club "TWENOT" some time ago a member was hospitalised for about 10 days after working with resin casted parts. He suffered from severe respiration problems and nose bleeds. The dangers involved with modelling can be divided in 2 kinds of risks: the immediate, short term risks and the long term risks. ● Problems to the respiratory system due to over exposure to chemicals. When working with sharp knives it is obviously that you will cut your fingers once in a while. Usually these are tiny cuts with razor sharp knives so this won’t be a very big problem. But every now and then on the ML newsgroups messages appear about some serious wounds people get from accidents with X-Acto blades or other sharp tools. There are some basic rules to prevent yourself from cutting really bad: never work towards yourself, always cut away from yourself. If the knife slips away you won't cut yourself badly in your hand or fingers. What is a bigger problem is the fact that splinters, sawdust and other tiny bits can come into your eye. Also electrical tools can let drill bit "shrapnel" fly all around your workbench. Avoid injuries by wearing safety glasses and if this occurs: Do Not rub your eyes! - ask help to rinse your eyes with some clean water and see a doctor if your eyes keep hurting. With this I mean contamination of your eyes with fumes from superglue, thinners, solvents and paints. Don’t rub your eyes, rinse with water and see a doctor. When you have got Superglue, or AcrylCyanoate Glue in your eyes go directly to a doctor, don’t attempt to open the hurted eye yourself as you might damage the lense of your eye. Damage to your lenses is irreversable! Some of the practices in the hobby involves heating plastics on an open flame, soldering-irons and heat treating PE sets. Often this is done on a workbench loaded with other hobby gear. Take a look around, what do you see? A bottle of Thinner? Some turpentine and alcohol based thinners too? Perhaps an open jar with thinner for cleaning brushes? Polystyrene glue? All these chemicals are highly flammable. In short: Be very careful with heat and open flames. An accident can occur before you even realise it. And be honest, do you have a fire extinguisher at hand on your workbench? Allergic reactions to certain chemicals and problems to the respitory system due to over exposure to chemicals. Allergic reactions occur when we come in contact with materials our body cannot really cope with. Allergic reactions can display itself at the skin, like red spots and even wounds in the long term and as problems with the respiratory system. We are all know people being allergic to cats and dogs while Hayfever is also a typical allergic reaction. It is a fact that you can usually withstand a lot of contact with a material you’re in fact allergic to, without having any trouble at all. But when you finally reached the point where your body starts "over-reacting" to contact with a chemical it will hardly ever go away. You can develop an allergie for solvents and thinners and also resin, more precise PolyUrethane Resin is a chemical that can give very strong allergic attacks. As mentioned before a dutch modeller was hospitalised for about 10 days with severe nose bleeds, and big problems to his respiratory system. He was working with PolyUrethane Resin when the problems started. The dust from sanding some parts did the job. Therefore it is essential that you try to minimize the amount of dust you inhale when sanding, sawing and cutting plastics. The easiest way is to wear a safety mask, use wet sandpaper and clean up the workbench as often as possible. Also be sure not to eat, drink or smoke while working with these plastics. This may sound very dramatic but it doesn’t have to be. More and more literature is being published about a disease called OPS is now available and it is now clear that this disease is caused by minute braindamage due to years and years of working with solvents. In Holland the disease is called "Painters Disease" because this is one of the labourgroups that frequently show the effects of this disease. These effects are: sudden moodchanges, loss of concentration and feeling tired and numb. Altough most modellers don’t use large amounts of the thinners and solvents that may inflict injury upon people, they do often work in ill ventilated areas and very close to their faces, in fact usually they are sitting right above the fumes and vapours. These sovents are to be found in many paints, thinners, glues and puttys. Some solvents are also possible carcinogens which means they may increase the risk for developping cancer. I will give you a short list of chemicals commonly used by many modellers with their risks for your healt. Enamel Paints: paints based on oils, their thinners are the most risky components. Pigments in paint: Some of the pigments in paints are based on oxidised metals like Cadmium and Titanium. A dutch beer brewery (Heineken) had to destroy all of their yellow crates a few years back because of the Cadmium Yellow pigments in the plastics. As this cost them millions you can understand they didn't do this voluntarily. The good news is that most of these pigments are now no longer used. PolyUrethane Resin: plastic, the dust is the most dangerous, because it can enter your respitory system. Primer paints: Often from a spray can, lots of unhealty vapours and pigments. Soldering lead: The fumes are not very healty, lead is very poisonous. For most solvents and fumes a respitory mask will do. Get a type with changable filters so that you will be cheaper of in the long term. A good mask will cost you about 30 US Dollars and it will last for ages. - Don’t lick your brushes. - Wash your hands after finishing the job, don’t eat, drink or smoke during the job. - Use a dust mask when sanding plastics and always try to use wet paper. Apart from the healt advantages you will get a smoother finish to. - When working with resin: Don’t use your Proxxon, Dremel or other elecrical tool, the dust generated by these tools is enormous. - Work in good light conditions so that you won’t accidentally cut your fingers. - Be very carefull when building your own compressor, a friend of mine build a compressor from an old refrigerator compressor and an old gastank. He blew up his shed because he forgot to turn the thing of and it had no pressure safety devices. - Be very carefull with pressurised gas containers, I have seen postings of people wanting to use Nitrogen gas, Carbondioxide and other industrial gasses as a repellant for their airbrush jobs. DON’T do this, a (silent) compressor is still the best option. After reading this article when it was published in the MIP, the magazine of the Dutch chapter of IPMS Ruud Pronk, produck Manager Filters and Masks at Dräger Nederland wrote a sequel, containing the know how he proffesionally has about protecting devices. It is well worth reading! When looking at our hobby with my proffesional background I’m sorry that I have to state that while modelling people use many potential dangerous chemicals that can harm ones health. In this situation the employer is responsible for providing the best possible solutions to prevent health hazards to the people that work for him. But working with these chemicals as a hobbïist these laws will not protect you and it is of great importance that we understand the risks and concequences. Substances that are harmfull to the environment. Swallowing is in many cases a simple matter of hygiene. At locations where is dealt with poisons you need to wash your hands, face and arms from time to time. Eating, drinking and/or smoking is a welknow contamination source so that’s a NO GO! Swallowing poisons is normally a matter of personal disciple, and the willingness to follow that discipline is often a matter of knowledge about the chemicals we work with. Many dangerous substances are absorbed trough the human skin. This can become a critical situation when a large amount of it is spilled when accidentally turning a bottle over at the worktop. Instant poisoning needs immediate action: do you know which actions to start with the different chemicals you work with? For every dangerous substance you can find a safety sheet (Material Safety and Data Sheet or MSDS) that contains the most important data about the chemical it concerns. In Dutch and other European laws a compact version of this sheet is obliged on the packaging of the chemical. On the internet you can also find these sheets, just type the name of the chemical of simply MSDS in the search engine of your browser and normally you will find what you are looking for. Be aware that many companies use commercial names for their products, but by checking the labels you must be able to find the substances used in their product. Poisoning trough the respiration system is the most common and best known cause, and will be recognised as the primary cause of poisoning by many. -Fog/Mist: A combination of gas with small droplets of a liquid, also know as aerosols. First I’d like to state that facial hair like moustaches and beards influence the effectiveness of all types of protecting devices in a negative way. Everything that sits between the bare skin and the edges of a mask causes leaks. And thus by-passing the filters that are used to absorb the dangerous substances. It helps to read the manual that usualy is upplied ith the filter of your choice, it normally describes how to check for leaks. Independent protection means you can breathe independent from the surrounding environment, most often we are talking about scuba gear or the pressurised air tanks and masks used in industry and/or the fire department. Depending means you breathe the surrounding air but filter the dangerous gasses and vapours from it. This is most often used. 1) Dust filter: It’s all in the name: This type of cartridge only filters uot dust from the air you breath. They will not protect you from gasses and/or vapours. 2) Gas filters: These filters will protect you from harmfull chemical vapours and gasses. 3) Combined filters, simply a combination of the 2 filters mentioned above. Half face masks: that are intented for the breathing only. Masks for one time use only, they must be disposed after use. Disposable masks are not as effective as the masks that can be re-used. The main problem is often to get a good tight fit on the face. Often these masks leak air between the edges and the skin so even if the mask itslf is made of quality materials the air will by-pass the mask and you will still breathe in harmfull substances. These disposable masks are only usable when the exposere to dust is little and not for too long a time. They are not really suitable as personal protection for most of the chemicals allready named here. FFP3: These are the masks with the highest classification and they will filter particles that are smaller then 0,1 mg/M3 like asbestos and quartz. When using a filter you will feel a resistance in the airflow. This is quite normal, and the better the filters the highr the resistance will b. Specially when using a very fine FFP3 filter we advice you to use one with a valve, thus reducing the resistance when breathing out. You won’t find these filters in a DIY shop very often, they are a lot more expensive then masks without a valve. Now the question arises: how long will my mask last? - How much pollution is on the mask after use? Also leaving the mask at the workdesk will cause it to get dirty very easy. Molecules bind fysically to the carbon (Adsobtion) or it can be binded chemically. (Chemosorbtion) Depending on the filter and chemicals one of both processes take place and the choice of filter should always be made with the pollutionlevel taken in consideration. A= Browne strip, usable for organic vapours with a boiling temperature >65 degrees Celcius. AX= (Letters) Organic vapours with a boiling temperature < 65 degrees Celcius. P= White strip for dust, because a good one also filters out dust particles. 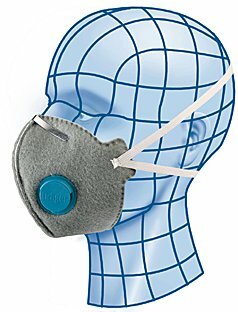 On each filter that is made following official standards there is also an indication for it’s capacity, devided in 3 classes: Class 3 has the highest capacity, class 1 and 2 normally are used with masks that only cover the mouth and nose. A warning is in it’s place here: In many DIY shops you can buy 1 or 2 kinds of carbon filed masks but these are not made according to official, industrial standards. They will function in one way or another, but if they are the best possible solution?? How long a filter will last depends on several different matters. - A combination of different chemicals: due to differences in reactioncapacity some chemicals tend to slip through the filter because others bind much quicker to the carbon. This can even result is exchanging chemicals that were allready bonded by the carbon to let go again, in favour of the new chemical. - Temperature and humidity, as a rule you can say the higher they get the worse they effect the capacity of he filter used. - The amount of air and the concentration of the pollution in that airflow. - A filter that is used before will contain chemicals that can be released during the next use. - When a filter is stored between use it will continue to absorb humid and chemicals from the surrounding air, so lock it tight in a plastic bag or something similar. - If the air contains droplets or a mist of chemicals (Airbrushing!) it will result in a very high contamination rate. Using a P-filter will prevent this for a good deal, thus keeping the filter in better shape. - Mechanical blockage of the filter by high concentrations of dust particals. Maximum time for using a filter is 8 hours total, over a 3 month period, providing that the filter is stored in an airtight seal in between use. If you smell the chemical trough the mask it’s a clear sign that the filter is saturated and needs to be replaced immediatly. On a good quality mask you will be able to find a production date and when stored in the approperiate way it can be used for 4 years after production. A good way to store your mask is: In a dry, sealed bag under room temperature. These figures are made following standard safety rules, but you will probarly find out that your filtermask will last a little longer, due to the low exposure rates normally involved with the smaller amounts used in our hobby. It makes a big difference if you are working with a small bottle of a thinner compared with a truckload if it. 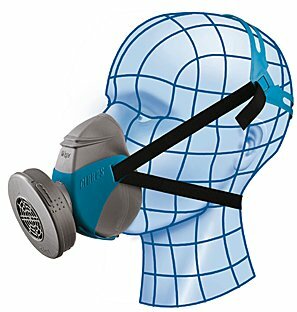 Use at least a filtermask that covers your breathing organs (Nose, Mouth) to keep safe and healthy. After studying the different chemicals used in our hobby I came to the conclusion that a A2-P2 mask is the best and safest possible solution with the best cost/effect ratio. There are special filters for working with chemicals like Aceton, with a bigger absorbing capacity. The filter I advice will provide you the same absorbing quality, but will last a little shorter. Even when taking this in consideration the A2-P2 filter is still the best and cheapest possible solution, even though it’s shorter lifetime. I’d also like to thank Ruud pronk for his excelent article and the pictures he provided. With no doubt you will be able to find one or two near you in the yellow pages.